All women want that dazzling look and feel of wearing impressive jewels, but unfortunately not everyone can afford it without breaking the bank until now! That's because gem-quality diamonds are now being grown in laboratories. The only main difference between our stones and genuine diamonds is that instead of the millions of years it takes to create natural diamonds, they're grown by man in a matter of days. Specialized laboratories can now recreate conditions that are similar to those which occur naturally, hundreds of miles below the Earth's surface. These stones sparkle and have the same amazing fire and brilliance that genuine jewels have. This effect can only be achieved by the specific manufacturing process where chemical components almost identical to those which are found in genuine diamonds are compressed under tremendous heat (approximately 3000 degrees Fahrenheit - the same temperature used to melt steel) and the result is a stone that has the same reflective index, dispersion of light and hardness as close to a naturally grown diamond as humanly possible. Therefore they are strong enough and hard enough to be cut with the same intricate facets as genuine stones. Facets are what make diamonds sparkle and reflect light. So this intricate cutting process makes the depth of the stone have that same crisp, clean appearance that naturally occurring diamonds have, where the light dances with life as it bounces off the stones. These lab-grown diamonds, high quality zirconites and Swarovski crystals are what make up all of our merchandise and why our items sparkle more than almost anything else out there! How Can I Tell A Man-Made Diamond from a Naturally Grown One? The answer is you probably can't! These synthetic diamonds have such slight differences from naturally grown diamonds that only a well-trained jeweler would be able to discern any difference at all. What they might see under a magnifying loop would be: A) Different growth patterns and B) A lack of inclusions inclusions are those bits of dark minerals that get trapped in a natural diamond as it's formed beneath the earth's surface. Because inclusions are regarded as flaws, a lack of inclusions is actually a good thing. However, our goal is not to pass off our stones as genuine mined diamonds from the Earth. We'll leave that to you! Borrowed Bling holds the national trademark on "Television Jewels". Our gorgeous pieces are sought after by many of today's celebrities, television studios and hottest TV shows because of the amazing look, quality and price. 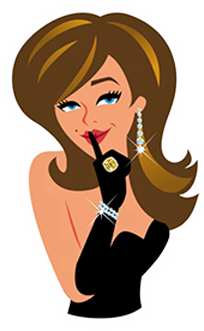 Borrowed Bling has been written about in: Cosmo, Marie Claire, Good Housekeeping, The New York Times, Newsweek, Flair, The Wall Street Journal, The Washington Times, Utah This Week, MSN News, The Tucson Citizen, Green Bay Press Gazette, Florida Sun Sentinel, and The Houston Chronicle. They have also been featured on the Tyra Banks Show, E! Style News, E! Daily 10, KTLA News, Inside Edition and the Good Housekeeping TV special. Our stones are set into designs and settings that you'd expect to see in the most impressive jewelry stores in the world. The result is an amazing piece of jewelry that you'd be able to wear side by side with real diamonds and no one would be able to tell them apart. 90% of our items are set in sterling silver, which is sealed in platinum-rhodium (which looks just like white gold), or sealed in 14 kt. yellow gold. The reason for the sealing process is to reduce the likelihood of tarnishing and to give the piece the same shine and finish that solid gold or platinum settings have. The other 10% of items on our site are set in non-tarnishing metals that are guaranteed never to darken or change color, while a few others are actually set into 14 kt. white or yellow gold. Read each item description to find out more about the item(s) you are interested in. To care for all of our items we recommend taking them off before you do anything that would get them wet, such as swimming, showering, doing dishes, washing your hands frequently, etc. Water will tend to dull the shine of the setting over the course of time, as is the case with genuine gold and platinum settings as well. We also recommend cleaning our jewelry with a simple dab of ordinary toothpaste placed on an old toothbrush. Add a drop or two of water to the paste and scrub the stones gently clean on the top and underside of the stone. Rinse quickly in warm (not hot) water and dry thoroughly. The stones will shine like new again without any harsh chemicals to damage the settings. Never soak jewelry in chemical cleaning agents. To become a member of our site is absolutely FREE! There are no monthly fees or obligations if you wish to sign up as a buying member, which enables you to purchase our items at the shown wholesale price. If you wish to sign up as a renting member then there is a set monthly charge that will be billed to your credit card around the same day each month. There are 3 borrowing levels: The Countess Level at $29.95/mo, The Duchess Level at $49.95/mo, or The Movie Star Level at $99.95/mo. These flat monthly fees enable you to rent as much jewelry as you want for that month. As long as your previously rented items are returned to us, you can keep renting items over and over again all month long. There are no hidden or extra fees, no matter how long you keep the items. We do require a three - month minimum commitment for renting members because it takes a few months for you to really absorb how much fun our site can be and see enough jewelry items to know the kind of outstanding quality and variety we have. After your 3-month commitment is met, you can cancel your membership at any time, (with at least 14 days advance notice prior to your next billing cycle due date). There is a quick link on our site to cancel. 2) If we had not been able to collect your flat-rate monthly membership fee successfully during any of the months that you remained an active member with us, in which case the security deposit would be kept to cover any past due fees.